Port (Germany) offers a module featuring CANopen connectivity. It also provides interfaces to Profinet-RT, Ethernet-IP, and Ethercat. Based on the RIN32M3EC multi-protocol communication IC by Renesas and the Generic Open Abstraction Layer by Port, the launched SoM provides a CANopen interface and interfaces to several industrial Ethernet solutions. The connection to the host controller is realized by means of SPI (Serial Peripheral Interface). “One hardware, many real time solutions” is marketing slogan of the German software provider. The host interface module can be equipped with different connectors: RJ45, M12, M8, or Mini I/O. A provided management and integration tool simplifies the connection to the host controller. The module can also be used as a hardware platform for IoT (Internet of Things) applications. It is pre-certified (with example application programs). The dual-ported Ethernet interface supports several application layers. With the generic API (Application Programming Interface), the provided protocol library can be accessed from an application processor in order to exchange real-time network data with the user application via the SPI interface. This API also enables access to the CANopen protocol stack. 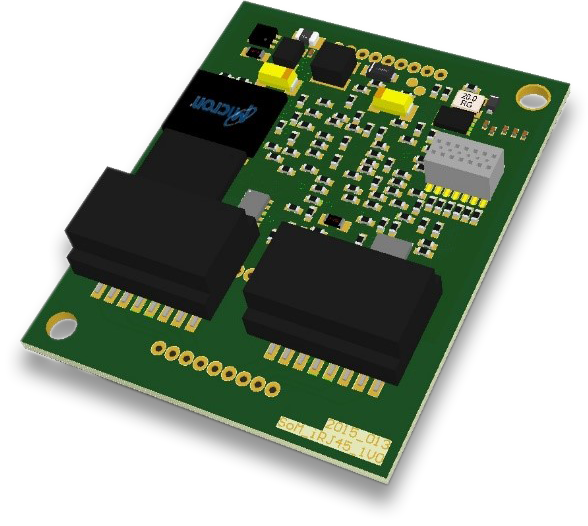 The SPI-connected application processor has control of the CANopen protocol stack running on the module’s CPU. This approach avoids interfering the modules’ real-time communication or wasting the performance of the host processor. The CANopen interface complies with the latest version released by CiA. A tool chain covering evaluation boards (module and application processor), API source code, and host application examples including documentation are available.